Soybean is a widely cultivated crop and it serves as a major source of protein and vegetable oil. The growth and yield of soybean are markedly affected by adverse environmental conditions including abiotic and biotic stresses. Nanoparticles (NPs), which are the materials with specific size ranging from 1 to 100 nm, are used in agricultural products on a large scale. NPs cause differential growth effects on plants depending on their sizes, plant species/growth phase, and stress conditions. The current knowledge of NPs effects on plant growth is increasing; while the understanding of the underlying mechanisms and metabolisms involved is limited. In this review, characteristic aspects of plant NPs interaction are summarized. In addition, the morphological and molecular mechanisms mediated by NPs on soybean are addressed. Furthermore, the impact of NPs on the nutritional quality of plants is discussed. Continued advances of NPs on soybean proteomics are expected to contribute towards better understanding of the plant responses under various conditions. Keywords: Aluminum oxide, nanoparticles, proteomics, silver, soybean, stress. Keywords:Aluminum oxide, nanoparticles, proteomics, silver, soybean, stress. Abstract:Soybean is a widely cultivated crop and it serves as a major source of protein and vegetable oil. The growth and yield of soybean are markedly affected by adverse environmental conditions including abiotic and biotic stresses. Nanoparticles (NPs), which are the materials with specific size ranging from 1 to 100 nm, are used in agricultural products on a large scale. NPs cause differential growth effects on plants depending on their sizes, plant species/growth phase, and stress conditions. The current knowledge of NPs effects on plant growth is increasing; while the understanding of the underlying mechanisms and metabolisms involved is limited. 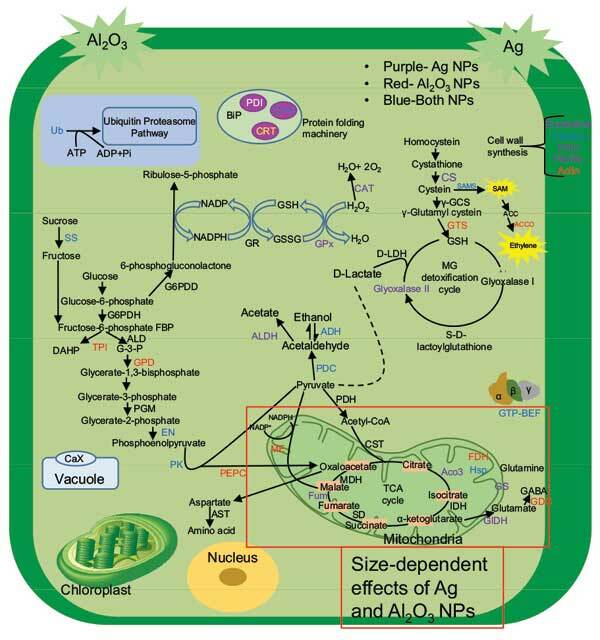 In this review, characteristic aspects of plant NPs interaction are summarized. In addition, the morphological and molecular mechanisms mediated by NPs on soybean are addressed. Furthermore, the impact of NPs on the nutritional quality of plants is discussed. Continued advances of NPs on soybean proteomics are expected to contribute towards better understanding of the plant responses under various conditions.